Screen quality on this monitor is very reliable it features full color and can be left active continuously while you are driving down the road if you choose to add a 2nd camera you can toggle between them with a push of a button. As for the brightness, it will look great even in direct sunlight but will auto dim at night for a softer more comfortable view. if you want to upgrade or change the monitor use our “Customize and upgrade” section at the top right of the page. There you will find that we have split screens, mirrors, in all shapes and sizes to fit any vehicles. This system includes our standard license plate backup camera with a full color lens and military grade night vision, the viewable angle is 120 degrees and like all our camera it runs continuously while you’re driving down the road. These specs can be upgraded by using the “Customize and Upgrade” section at the top right of the page. Hi-Definition License Plate Backup Camera bar (CCD)-These backup cameras will fit the license plate of any standard vehicle, can be placed on the top or bottom of the license plate. The lens on the camera is Hi-Definition (CCD) and gives you fantastic day time clarity and Automatic Night vision. Available in 3 colors, Silver (Chrome), Metallic Black, and Piano White. (if you upgrade to high definition at the top right of the page it will give you even better color but its mainly for enhanced night vision performance. Concealed License Plate camera- it has a special thin bar that will slide behind your license plate between the vehicle and the actual plate, it is concealed behind the plate with only a small camera peeking above the plate for a clean look. License Plate Backup Camera with Projecting Light- This is a license plate camera with a standard definition lens (Upgradable to Hi-Def) its special because of the type of night vision is has. Instead of using LED light to soak in the light available, this camera has 4 high powered LEDs that project light backward this way you can see behind you with real light. 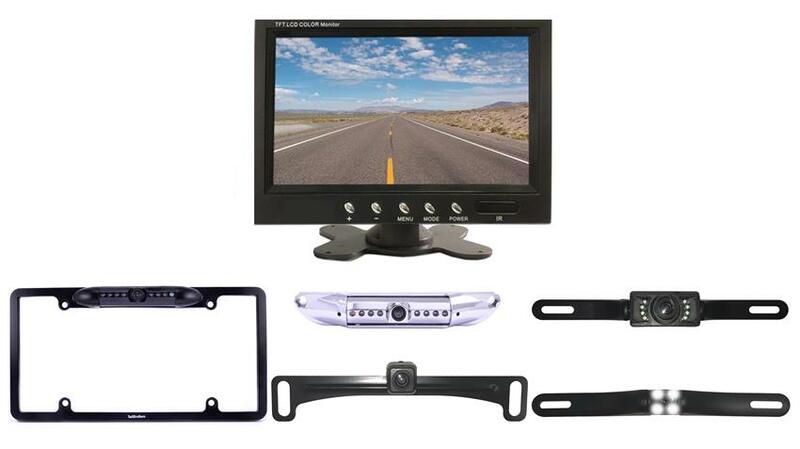 European License Plate Rear View Camera- will fit any standard European license plate. features a universal euro size frame with numerous holes for easy installation. Also, This system, like most of our vehicular products that have an LCD screen that can be used for video gaming, consider that a perk or bonus for purchasing our back up system (others block that feature).